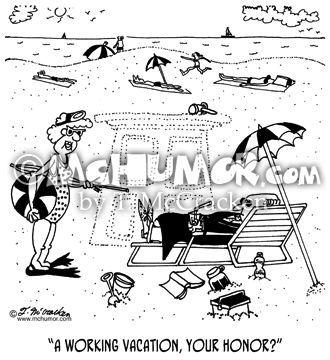 Judge Cartoon 5316: A woman on beach saying to a judge sitting in a chair in his robe next to a sand castle in the shape of his bench, "A working vacation, your honor?" 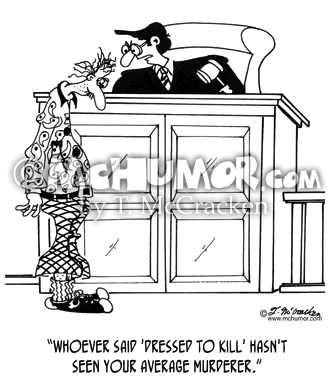 Murder Cartoon 5303: A judge looking at a man wearing tacky clothing says, "Whoever said 'dressed to kill' hasn't seen your average murderer." 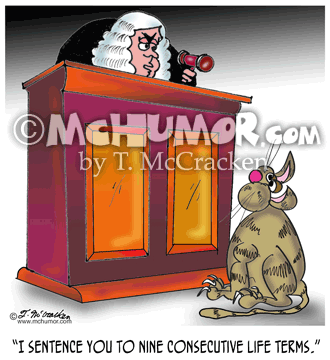 Cat Cartoon 2994: A judge saying to a cat, "I sentence you to nine consecutive life terms." 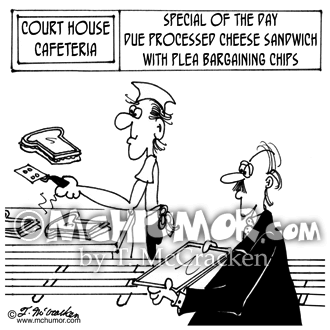 Court Cartoon 5322: At the Court House Cafeteria the Special of the Day is "Due Processed Cheese Sandwich with Plea Bargaining Chips." 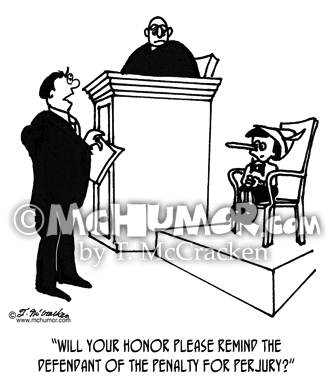 Perjury Cartoon 3144: A lawyer questioning Pinocchio whose nose is quite long asks the judge, "Will your honor please remind the defendant of the penalty for perjury?" 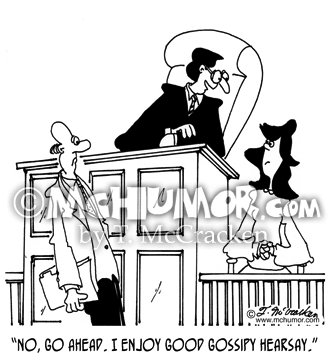 Judge Cartoon 5321: A judge saying to a witness, "No, go ahead. 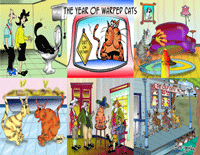 I enjoy good gossipy hearsay." 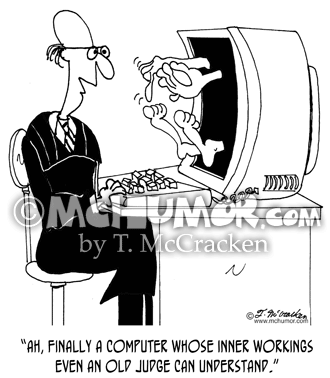 Judge Cartoon 7496: Looking at a computer with fingers and toes that it's using to count on a judge says, "Ah, finally a computer whose inner workings even an old judge can understand." 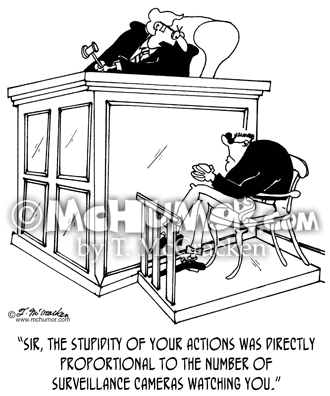 Crime Cartoon 7348: A judge saying, "Sir, the stupidity of your actions was directly proportional to the number of surveillance cameras watching you." 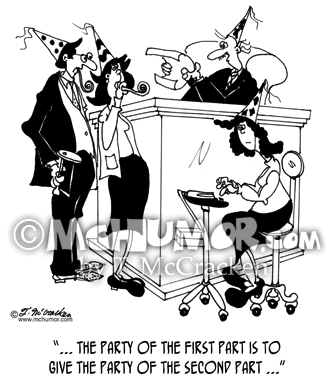 Judge Cartoon 5515: While a court reporter wearing a party hat types, a judge also wearing a party hat says to people wearing party hats, "... the party of the first part is to give the party of the second part ..."
Juggling Cartoon 6455: "The Court Jester." 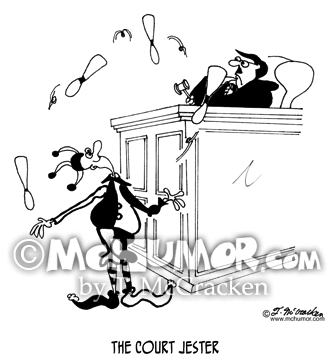 In a court of law is a juggler in a jester costume. 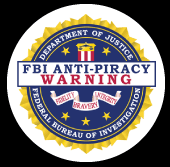 A Hung Jury or a Hostage Crisis?